If there's anything I admire more than a dedicated friend, it is a dedicated enemy. 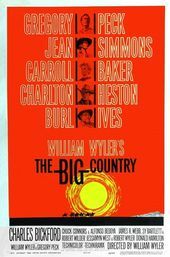 Author Pat Kirkham discusses the opening titles for The Big Country, designed by Saul Bass, from her authoritative book Saul Bass: A Life in Film and Design. Saul created a title sequence, a symbol and a comprehensive advertising campaign for this drama about a cultured Easterner (Gregory Peck) trying to make peace between two Western families ﬁghting over water rights. “This was a ﬁlm about an isolated community in the West, a primitive place where the long arm of the law had not yet reached, and where feud-like animosities bubbled. Into this community came a cultural misﬁt from the East. What I tried to do in the title sequence was to dramatize, in tightly compressed montage, the three-month journey that Peck's character has made before the story starts. To express the distance from the East, to convey the vastness of empty spaces, and thus dramatize the isolation of the Western town, I used a series of shots showing a stagecoach as a tiny object on the horizon, cross-cutting to intense ultra close-ups of the stagecoach on the move.., the horses' hooves ﬂashing, hitting the ground, the blurred wheel spokes and hubs as they revolved furiously, the horses' manes whipping through the air, their heads and eyes ﬂashing through the frame.